The development of electric and electronic musical instruments – as well as associated music-production systems – is one of the defining strands in the history of music over the last century. In fact, the advent of electric instruments predates even the twentieth century. The terms 'electric' and 'electronic' are often interchanged erroneously. By convention, the term 'electric' refers to instruments that employ an electrical system to amplify and/or modify a sound that was originally produced by acoustic means. An obvious example of such an instrument is the electric guitar, in which the sound of the natural vibration of strings is amplified and modified by electrical means. On the other hand, an instrument like a synthesizer is referred to as 'electronic' because it generates its sounds entirely from electronic components, such as oscillators or microchips, with no natural, acoustic origin. A further subset of electric instruments is those that are known as 'electromechanical'. This term describes instruments in which an electric motor drives moving parts, which in turn are used to either generate or modify sound. Instruments in this category include the vibraphone and Hammond organ. For many centuries, amplifying devices used with musical instruments were entirely 'natural' – resonating boards and boxes, flared horns, and the like. With the nineteenth century's increasing use of electricity it was inevitable that this new force should enter the world of music. It did so first, not to everyone's liking, soon after the century turned. Thomas Edison floated an idea for an 'air relay' system of amplifying sound in 1876 but it was not truly launched until Sir Charles Parsons patented the compressed-air Auxetophone in 1903. At a demonstration in London in October 1906 two vast helical horns, resembling Sousaphones, faced a Promenade concert audience in the Queen's Hall and were hooked up to various instruments. Each proceeded to emit "sound-waves identical in quality and intonation but richer in tone and larger in volume than those produced by the instrument itself unaided by the Auxetophone", according to Parsons. The new invention should have sent a shiver of excitement through the musical world; instead, it merely succeeded in sending the audience to the back of the hall with their hands clasped over their ears. Furthermore, misgivings amongst the orchestra were crystallized by Sir Henry Wood's ill-considered pronouncement that the Auxetophone "will be able to reinforce five-stringed instruments ... sufficiently to combat the complete woodwind and brass of the Wagnerian orchestra." Visions of mass unemployment among the hapless string players quickly brought an end to the Auxetophone for concert use. During the 1930s electricity was used – directly, and without the loud hiss of the Auxetophone's escaping air – for electric pianos (e.g. the 'neo-Bechstein') and for guitars, the latter indispensable today in pop and rock music; a related species was known during the 1940s as the Hawaiian guitar. These and Parson's invention amplified the sounds of conventional instruments (or modifications thereof) through loudspeakers. They are a group apart from the next to use or abuse electricity in the name of music: instruments whose sound production relies entirely upon electricity when played by a human agent. Once again the year 1906 marks the beginning of the rot. In that year Thaddeus Cahill, a Canadian scientist, demonstrated his Telharmonium in New York. No-one has survived to tell of its onslaught on the senses, and by World War I the instrument was 'lost', which must be put down to sheer carelessness, since it weighed 200 tons. After the war, in 1920, the Russian inventor Lev Sergeyevich Termin (1896–1993) demonstrated in Petrograd an extraordinarily clever instrument which he called the Etherophone. It consisted of a box with an antenna like a whip aerial. The player at no time touches the instrument during play. Pitch depends on the remoteness or proximity of his right hand to the aerial; amplitude was at first controlled by his left hand's position relative to a second, loop-like, antenna. In the improved model (1928) the left hand controls a cut-out device to separate successive notes while a foot-operated pedal controls volume. The strange waving and weaving of the player's hands had perhaps more appeal than the disembodied sound of molded oscillators – recent demonstrations on TV have been visually mystifying but musically anonymous – but the Soviet composer Andrei Filippovich Pashchenko was sufficiently impressed in 1924 temporarily to abandon choral and opera composing to become known as the theremin or thereminovox (made by an inventor who by this time was known as Leo Theremin). Joseph Schillinger was next: in 1929 he included a theremin in his First Airphonic Suite. Apparently there was not to be a second. In 1923 came Jorg Mager's Spherophone in Germany, a species of electronic organ that, with sophisticated additions, became the Partiturophone before becoming history. But the Frenchman Maurice Martenot scored a real hit when, on April 20,1928, his ondes musicale Poeme Symphonique. Like Theremin's instrument, the ondes musicale quickly changed its name to honor its inventor, and the ondes Martenot has appeared in scores by Boulez, Honegger, Ibert, Jolovet, Koechlin, Milhaud, Schmitt, Varese and others. Messiaen, in Fetes des belles eaux (1937) requires six of the beasts. A keyboard controls the frequency of a variable oscillator in the bowls of the ondes, the amplified signal issuing from a loudspeaker. Alternatively, a sliding ribbon operated by a finger ring activates the oscillator for glissando effects. Part-writing is not possible, for the instrument is capable of producing only one note at a time, Bach, at least, was safe for a time. Tortured oscillators protesting through a loudspeaker also feature in Friedrich Adolf Trautwein's invention in Berlin in 1930. Not for Trautwein the false modesty of a fancy name for his instrument: he came right out with it and called it a Trautonium. A wire and a metal rail are connected to an oscillator. The performer presses wire to rail at certain marked points to select the notes, the pressure controlling the amplitude; timbre is modified by push buttons. Composers as notable as Richard Strauss and Hindemith (and as obscure and unwise as Genzmer, Hoffer and Weismann) have written for the instrument. 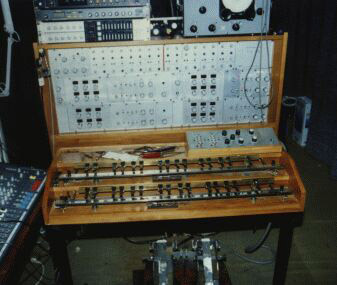 While one Sala modified it to become the Mixtur-Trautonium. Three years later, Oskar Vieling in Berlin also made an oscillator-based instrument, the Electrochord (he spared us the 'Vielophone'), but the year 1933 is remembered for a rather more lasting device. Laurens Hammond (1895–1973) in the USA invented an 'organ' in which rotating wheels in a magnetic field induce currents which are amplified and modified electronically. The Hammond organ continues to enjoy popularity in the light music field because its clever design enables an extremely wide variety of sounds to be produced on a relatively compact console instrument. After World War II electronics increased so hugely in sophistication that their invasion of the musical scene transformed our listening, and our playing. 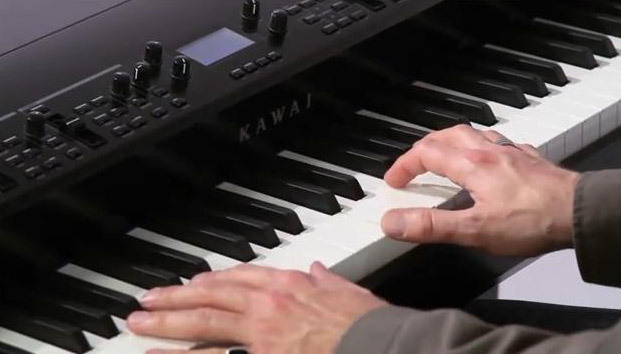 The Yamaha Clavinola, a development of the electric piano, could sound like a piano or like most other instruments. Electro-acoustic music and synthesizer music merged into one, but a quick glance at the beginnings of synthesizer music is necessary to complete our survey of electric instruments. Synthesizers grew out of the machinery developed by electronic composers; this in turn grew out of a marriage between some of the electric instrument ideas noted above and the 'tape-recorder-school' of musique concrete composers. In 1954 Robert Moog began manufacturing theremins in New York and 11 years later made his first synthesizer. However, as early as 1960, Drs J .R. Pierce and M. V. Mathews at the Bell Telephone Laboratories were constructing digital programmes to feed into an IBM 7090 computer and obtaining music via a digital-to-analog transducer. A recording called Music from Mathematics was issued in 1962 (indisputably the very first digital recording) by the American Decca Record Company. It contains compositions by the two doctors and others and includes Bicycle Built for Two 'sung' by the composer. However, it was Moog's synthesizer of 1965, and the 1969 CBS disc Switched-on Bach (arrangements by Walter Carlos that showed the Moog was capable of doing what Martenot could not) which really caught the imagination. The modern Moog (correctly pronounced to rhyme with 'vogue') is an electronic jungle of keyboards, amplifiers, oscillators, filters, mixers, reverberators, etc., all geared to make sounds that Sir Henry Wood's fiddlers could never have imagined, let alone produced. Synthesizer music is now widely heard and is particularly popular with producers of TV commercials, selectors of TV and radio signature tunes, and for dramatic sound effects. Doubtless the first concerto for synthesizer and orchestra is imminent, though the depth and width of the synthesizer's capabilities would make the orchestra superfluous.